General selling proposition Use Rejoice, you have smooth hair and attract other people in all ways. Customer benefits To be charming and attractive with smooth hair and help to build a good relationship. Description In the wedding, the groom and the bride play a game with their friends. The groom is blindfolded to find his bride among all his girlfriends. At the end, he recognizes his bride by touching the girl’s silky and perfect hair. General selling proposition If you don’t use Rexona, your body excretes sweat that keeps people far away from you and makes you get out of attraction. Customer benefits Make your body become fresh and clean per day so that you are very active and confident. Personal values Confidence and sexual attraction, peace in mind, comfortable life. Description A young woman enjoys banana then throws its own peel on the street. Unfortunately, she falls down because of treading in the banana peel. Simultaneously, her bag is casted on the skateboard which is running on the road. She rushes chasing her bag and meets a man keeping her bag in his hand. They look at each other passionately, but he feels a bad smell from her body. Accidentally, she got a tube of Rexona dropping from an unknown place. After using it, she becomes confident and attractive. Evaluation Impressive, persuasive and easy to remember. Context A daughter and her mother in a Canadian prison. Description A daughter goes to visit her mother who is cleaning the bathroom in a prison. She doesn’t know when her mother gets out of the bathroom because she has to clean the toughest dirt by an ineffective cleaning liquid. Evaluation Personally, emotional and impressive. give me loving arms, away from harm. to feel the sun again upon my face. – Metaphor: “you” maybe is anyone or God, “I” and “me” is children. – Repetition: clearly used in the two first cantos: “on bended knee, in the shadow…..”; “Aching for home, for something…..”. I am really interested in this meaning of the poem. The poem isn’t about any specific children in any society, but is about all children who suffer misfortune in real life. Each canto shows a kind of children whose lifetime is unhappy and full of hardship and sorrow such as diseases, homelessness and wars. Therefore, they have dreams of getting out of unluckiness and enjoying a beautiful life time with sunlight, love and peace. For someone, these dreams are so simple and apparent, but for these children, it is so far from their hand and difficult to achieve. They can just satisfy these things by dreaming and praying. 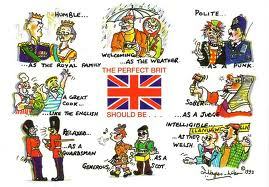 How piteous they are! In sum up, the poem successfully reflects a real unfair life in which children live like pitiful and innocent victims. It arouses the reader’s compassion to children and keeps in one’s mind about how to save the children’s lives when you hear the children’s prayers? One is EVIL: It is anger, envy, jealously, sorrow, regret, greed, arrogance, self-pity, guilt, resentment, inferiority, lies, false pride, and ego. The other is GOOD: It is joy, peace, love, hope, serenity, humility, kindness, empathy, generosity, truth and faith. – The battle between “wolves” – the constant contraction of two sides of character. After enjoying this story, I have a strong feeling of character. Firstly, each one owns these two sides of character simultaneously. They exist equally and contrast to each other extremely and interruptedly. One can’t accept the one side and except the other one. Secondly, one can transform oneself from the EVIL to the GOOD and vice versa early if behaving and acting prior to one of the sides. In conclusion, the story helps the readers recognize the real character in each one in order to balance and control oneself properly. This picture applies some rhetorical devices below to convey message to readers. – The sinking boat refers to a common and important task or work or problems that need to be done immediately by a group of people. 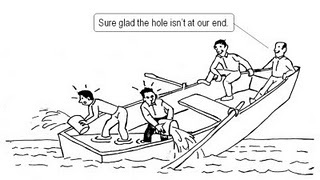 Irony: the sentence “sure glad the hole isn’t at our end” means the work is someone’s, but not everyone’s. This picture is worth seeing and thinking about working in group, specially, in a very big group. Generally, some people make their effort of fulfilling the common work as much as possible. However, some others ignore because they don’t see their benefits from doing the common work. That is reason they don’t contribute anymore. In short, this picture also reminds that everybody plays an important role in group, so everyone has to take responsibility for solving problems and places common interests above private interests.